In August 2009 OUL "Ob-Ugric languages: conceptual structures, lexicon, constructions, categories" has been launched as a collaborative research project of four universities in order to provide online descriptive resources for and modern linguistic analysis of two related and endangered Ob-Ugric languages Khanty (Ostyak) - Kazym and Surgut dialects - and Mansi (Vogul) - Northern and Eastern dialects. The project has been recognized within its selection procedure as a part of the EUROCORES programme, conducted by the European Science Foundation and funded by several European funding organisations, such as DFG (German Science Fund), FWF (Austrian Science Fund), OTKA (Hungarian Scientific Research Fund) and the Academy of Finland (Finnish Science Fund). The main purpose of the EUROCORES programme was to promote empirical research on underdescribed endangered languages. Within three years, linguists from Germany (LMU Munich), Austria (The University of Vienna), Finland (University of Helsinki) as well as Hungary (Eötvös Loránd University Budapest and University of Szeged) established a Virtual Research Environment without precedence. All research teams met on a regular basis, there were four major Ob-BABEL meetings: 2009 in Vienna, 2010 in Budapest, 2011 in Munich and 2012 in Helsinki. Research also has been supported by numerous collaborating researchers (linguists, ethnographers) and native speakers of Ob-Ugric dialects. •Deeper analysis is conducted of information structuring in Ob-Ugric: complex strategies employing several different devices, such as passive, object agreement, zero anaphora as markers of topicalisation, etc. •The project website as a Virtual Research Environment that serves as a gateway to interconnected modules: the interfaces for corpus/dictionaries creation and presentation, a tool for managing and presenting the comprehensive bibliography, to name just a few. •The bibliographic database, searchable by different parameters (about 7000 entries with full bibliographic description). It contains a large selection on publications on the Ob-Ugric languages and their dialects, also on ethnology, sociolinguistics, as well as on the culture, life and mythology of the Ob-Ugric peoples. Both Cyrillic and Latin input are supported and facilitated by a "predictive text" function, there is a phonetic search function, and the system recognises and links different spelling variants. Its compilation was not planned in the the proposal but found necessary in the first year of work. •The e-library providing an extensive collection of material on the Ob-Ugric languages and cultures. It also provides unique teaching materials compiled by the project members (i.a. three recent monographs on Khanty ethnography by the AP Prof. Lukina; practical courses of Kazym Khanty by the APs Dr. Solovar and Dr. Koshkareva). A variety of multimedia resources, such as a Khanty song data bank, fieldwork photographs and video clips is also included. 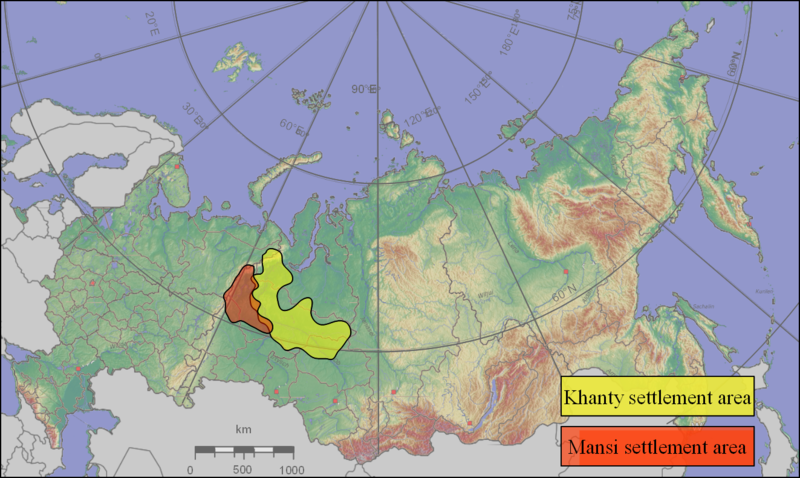 •The text corpus encompasses texts from Northern Mansi (130 IPA-transliterated texts, 18 of them glossed), Kazym Khanty (46/24) and Surgut Khanty (41/20). All texts were analysed (except for syntactic-pragmatic tagging) by means of the open source software Fieldworks Language Explorer (FLEx) by SIL. •The e-grammar allowing to browse the materials 1) by the dialect, 2) by linguistic subject, or 3) by the presentation form (plain text comments, tables, for several lexemes - an interactive form generator based on full inflection tables). The largest part of the content make up the basic levels of linguistic description, as it is here where a better analysis of Ob-Ugric starts. The published materials simultaneously represent the tools developed for analysis, e.g. the Position grammar templates. For each dialect a glossary of morphemes was compiled, to be linked both with the e-grammar and with the text corpus. •The e-dictionary section offering corpus-based queries which can be directed to one or up to four dialects. Many entries are enriched with ethnographic material (images, video, comments) and etymological information based on Uralonet (the digitalized Uralisches Etymologisches Wörterbuch, UEW); if found, an interactive link was put in the lexicon entry directly to the entry in Uralonet. The interactive concordance function between glossed texts and lexicon is being programmed. The word entries based on the text corpus have been enhanced with information from existing print dictionaries; associated (e.g. dialect) variants and associated allomorphs are recognized. All lexemes are translated into English and Russian, partly into German, and characterized by up to 56 linguistic parameters. Currently there are 6860 entries (Eastern Mansi 1147, Northern Mansi 2473, Kazym Khanty 2168, Surgut Khanty 1072). Of particular mention is the online version of the Mansi-Hungarian-German dictionary Munkácsi / Kálmán (1986), the result of immense work of the Hungarian team. It gives users access to rich semantic, dialectological, etymological information in this complex dictionary and its priceless illustrative material; as the data there is organised etymologically, it was difficult to use without linguistic knowledge of Mansi. The online version is searchable more easily due to a phonetic search function. Please note that several of these achievements have been developed further within the succeeding project OUDB. You will find more information there. For all publications and presentations please visit the section Events & Publications; additionally you can find contributions of participating researchers and our associated partners in our e-library.